It turns out that I’m kind of cheating with this recipe. I knew I’d already made it at some point over the last few years, but I didn’t know that I’d already posted a version of it on the blog! The fact that it was back in 2008 gives me a little wiggle room, though, right? See, the truth is, sometimes I just want a cookie. And when I want a cookie, I don’t want a peanut butter or sugar or fancy lavender or Sriracha concoction, I just want a chocolate chip cookie. My cookie cravings honestly come only once or twice a year, but when they do…well, just don’t stand in the way between me and my cookie. As with all chocolate chip cookies, The Joy of Vegan Baking‘s version tastes best when fresh baked–the chocolate must melt, the cookie be chewy warm. In 2008, I mentioned that I wasn’t in love with this recipe, but, looking back, I’m not sure what I didn’t like. It’s a fairly solid recipe. Flax eggs might make it better, but, as far as chocolate chip cookies go, these can be thin with less flour, cakey with more, and, all important, just use good quality chocolate (I use Ghirardelli semi-sweet chips) and you’re good to go. High quality dark chocolate–doesn’t that make everything better? Preheat the oven to 375 degrees Fahrenheit. 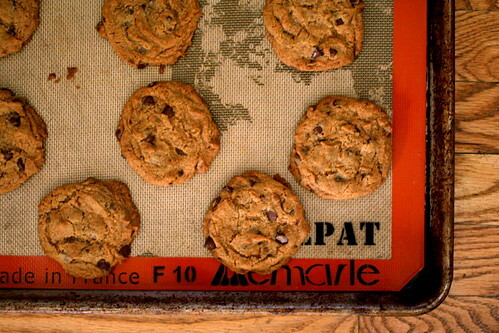 Line a cookie sheet with parchment paper/a non-stick cookie/baking sheet. In a food processor or blender, whip the egg replacer and water together, until it’s thick and creamy. In a large bowl, cream the margarine, sugars, and vanilla. Add the egg replacer to this wet mixture, and thoroughly combine. In a separate bowl, combine the flour, baking soda, and salt. Gradually beat the flour mixture into the wet mixture until it begins to form a dough. When it is almost thoroughly combined, stir in the chips. And, unfortunately (since, I agree, they are SO delicious) Ghirardelli’s semi sweet chips are not vegan, they contain milk fat. Their mini chips, however, do appear to be vegan. I love Trader Joe’s chips, which WERE vegan, but now they aren’t making those vegan anymore, either (I hoarded a few bags when I found out about that, but they are almost gone). Hmm…my bag’s ingredients list doesn’t include any milk fat, is milk fat somehow an ingredient but not on the list? I’ll have to look into it more! So, there is hope! That would be GREAT. Did you use the minis? The minis bag does appear to be accidentally vegan (my hubby got them for me!). Maybe there are semi-sweet chips that I haven’t seen that ARE vegan? That would be the bomb. The ones I used to use were the 60% bittersweet ones, and those definitely had milk fat, but the semi-sweet ones…vegan?!? Can you keep me posted, because I LOVED Ghirardelli’s chips. Meanwhile, I’ll re-check my store, and seriously, if I find those, I’m getting them. I did check the website, the only vegan (parve or pareve) products they say they carry are the cocoa powders…so, not sure, BUT, they don’t mention their baking chips at all on the website (that I could tell), so maybe?? XOXO! Totally keep me posted, now you got me all worked up! I use the Ghiradelli semi-sweet chips too, and they are most definitely vegan. Not fair-trade or organic or any of the other good stuff we should care about, but definitely vegan!! I get the ones in the gold foily bag at Kroger – around $3 a bag. These look like my perfect ccc! I might just have to throw this recipe down the chute of the ol’ de glutenizer today. MmmMMM! Chocolate chip cookies are so basic that there are a million recipes for them!! I totally trust Colleen Patrick-Goudreau. Joy of Vegan Baking is probably my most used baking book… yr look percect! I like good ol’ plain choc chips too, these look great, And I had to laugh at the idea of Sriracha choc chip cookies, eek! Man, I have read so many bad reviews of The Joy of Vegan Baking, it’s good to hear a good one. The chief complaint of the recipes is that they don’t seem to be well-tested – and instead are “just omni recipes with vegan substitutions”. Honestly that’s what’s kept me from buying it, as totally awesome as C P-G is (and she IS totally awesome). I don’t like veganized baking. I prefer to use a recipe that is vegan to begin with. I love TJOVB, but in addition to the changes I’m likely to make the the recipes themselves, you do have to watch her recipes for errors. Even in this choco chip cookie recipe in the book it says it yields one dozen cookies (um, no, of course it yields two dozen). I could tell just by looking at the recipe that one dozen was definitely incorrect. And her baking time is totally off (I have to bake mine for about 14 minutes, not the 8-10 she suggests). Oh they look so perfect! I think I am one of the very few people one who don’t own a copy of The Joy of Vegan Baking. Hi. I also use the Ghirardelli semi-sweet choc. chips as they were about the only ones I could find that didn’t contain milk. I’m almost completely sure that their 60% cacao bittersweet chips do contain milk (fat?) of some variety. Thanks for the review and the tips for this recipe! Thanks for this discussion- I was looking for eratta on this recipe after making them last night. Although super-delicious, I knew this couldn’t be for 12 cookies (holy crap!) and I think I will make changes to the amount of Earth Balance and flour mixture as well. The baking time was off for me too, I would say closer to 15 minutes. I used semi-sweet chips from Whole Foods & they were actually marked as vegan……. Still love Colleen & will try anything she comes up with!